Home » Log in or Log on – What’s the Difference? In the digital age, we need many new words and phrases to capture the online aspects of our lives. Many people who own a computer (or even a phone) access services and content several times a day, even without realizing it. Sometimes, doing so requires a passcode (like a phone with a screen lock), while other times, it does not. English has a different verb phrase for each of these scenarios: log in and log on. They might seem superficially indistinct, but there is actually a clear usage case for each term. What is the Difference Between Log in and Log on? In this post, I will compare log on vs log in. I will use each of these words in at least one example sentence, so you can see how they appear in context. I will also show you a mnemonic device, or memory trick, that will help you choose log on or log in correctly every time. What does log in mean? Log in is a verb phrase. When you log in to something, you provide credentials to access material. If the material is online, you might log in with a predetermined username and password. If you are logging in to a records room, for instance, or an evidence locker, these credentials might be an ID card or simply your name and title. This phrase comes from the physical logs that a person signs in these circumstances. Paper-and-pencil records of entry were widely kept to monitor entry before the digital revolution. Think of the visitors’ log at a school, or the guest log at a wedding. When you come to class, please log in to your computer and open the design software. If you log in with an incorrect password three times in a row, your online access will be blocked and you will have to call IT. See also login vs. log in. What does log on mean? Log on is also a verb phrase. When you log on to something, you are simply accessing digital material, without necessarily needing to provide credentials. When you logged on to this site, for example, you did not need to provide a password to read this article. Log on to the news website of your choice and choose an article to discuss in class next week. You can log on to a network drive from any computer connected to the network. If you need a username and password (or other credentials) to access something, you are logging in. If you can access it without credentials (like this site), you are logging on. 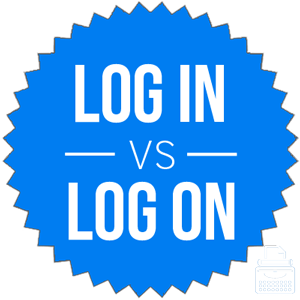 Here’s an easy way to remember log in vs. log on. Since the word credentials contains the letter I, like the word in, you can use this shared letter as a mnemonic device to remember when to use log in. Is it log in or log on? Log in and log on are verb phrases that deal with accessing digital content or restricted locations. To log in requires you to provide credentials. You can log on to something without credentials. These are not technically precise terms, but they capture actual usage by the majority of English users. 1 What is the Difference Between Log in and Log on?